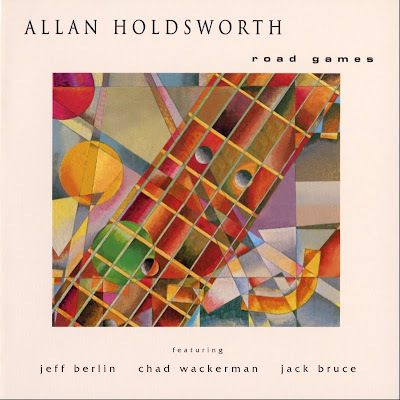 Also in the late '70s, Holdsworth launched a solo career, which over the years has seen the release of nearly 20 albums (a few standouts include 1983's Road Games, 1985's Metal Fatigue, 1994's Hard Hat Area, and 2000's The Sixteen Men of Tain), as the guitarist has been joined by such acclaimed musicians as Paul Williams (a former bandmate of Holdsworth's in Tempest), Gary Husband, Chad Wackerman, Gary Husband, Jimmy Johnson, Steve Hunt, and Alan Pasqua, among others. In the mid-'80s, Holdsworth was one of the first musicians to use a Synthaxe, a guitar that contained a breath controller that proved to be a cross between a synthesizer, guitar, and saxophone (Holdsworth was awarded Best Guitar Synthesist from 1989 through 1994 in the readers' poll of Guitar Player magazine). In the '90s, Holdsworth also created his own signature guitar model with the Carvin company. In the mid-'90s, Holdsworth briefly shifted away from his fusion originals and recorded an album with longtime musical partner Gordon Beck that dipped into jazz standards. The Sixteen Men of Tain (2000) marked another shift, in that it was the first Holdsworth release to feature an all-acoustic rhythm section. This was followed in 2002 by All Night Wrong, his first official live release. Then! Live in Tokyo was next, featuring Holdsworth's 1990 live band, which was followed by Against the Clock, a career retrospective, in 2005.